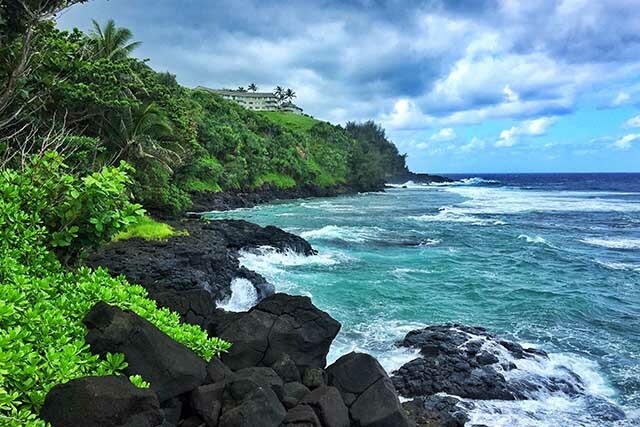 Known as ‘The Garden Isle’— Kauai is the low-key and inviting counterpart to Maui and the sister islands of Hawaii. For private jet travelers, Lihue Airport acts as the aviation gateway to all that this diverse destination has to offer. From the lush greenery of the Nā Pali Coast to the sharp contrast seen in the deep reds and awe-striking canyons of Waimea, the island blends diversity of both activity and scenery. Disrupt your pace and let your private jet charter to Kauai begin. Clay Lacy Aviation offers non-stop private jet charters, year-round from Seattle’s Boeing Field and Los Angeles’ Van Nuys Airport. Don’t be surprised when a friendly and professional cabin server greets you at boarding with a Hawaiian inspired experience— complete with handcrafted island-style cocktails and organically sourced fare—created with your specific requests in mind. Princeville is a natural choice for private jet travelers, but nestled on what is known as the sunny side of the island, Koa Kea Resort & Spa serves up world-class resort amenities with a boutique hotel touch. Simply steps from the ocean, the plantation-style villas and rooms create an idyllic gathering point for all of your island adventures. For those desiring a more personalized approach, Alekona Kauai offers both short term and long term luxury home rentals. Every detail of your vacation— from concierge services to stocking your fridge with the best organically sourced fare on the island— are orchestrated effortlessly by an experienced staff of professionals. All you need to do is arrive. Kauai may be known for its sleepy nightlife and slow pace, but the island’s culinary opportunities wake-up the scene with both casual fish taco stands and classy fine-dining establishments. Jim Moffat, of the acclaimed Bar Acuda— located in the heart of Hanalei— sources only the finest ingredients to complete a tapas and Mediterranean inspired menu. Restaurants like Red Salt and The Beach House doubly entice dinner guest through perfect sunset views and tiki torches, that cast a warm-glow, once the sun dips beneath the horizon. The laid back and slow pace of Kauai is one of its most endearing qualities, and Hanalei Town remains as one of the hippest ways to settle into the relaxing nature of the island. Quiet, serene, and undisturbed, one can find privacy and peace whether strolling the beach, enjoying a Poke Bowl in town, or meandering boutique shops. On Kauai, relaxing is part of the lifestyle. Kauai’s natural diversity of landscape mimics, or may even contribute, to the variety of activity that is available when on the island. Exclusive boat charter excursions hug a coastline teeming with abundant marine life or helicopter tours that allow visitors to see Kauai’s kaleidoscope of color from another perspective are only a few of the very many adventure activities that island goers can enjoy. Your dream trip to Kauai— or beyond— awaits. Contact the charter department at Clay Lacy. Book early for the widest selection of aircraft.